Bittersweet Enchantment: Blog Tour: Bound by Prophecy by Melissa Wright | Author Interview + Giveaway! 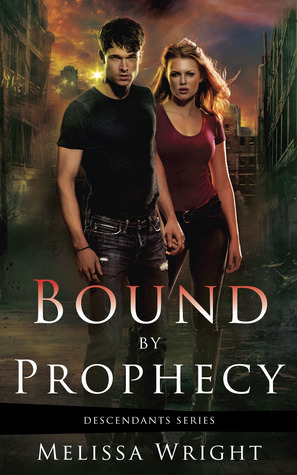 Blog Tour: Bound by Prophecy by Melissa Wright | Author Interview + Giveaway! Emily just wants her sister back. She doesn't care about the prophecy, or realize what’s at stake. 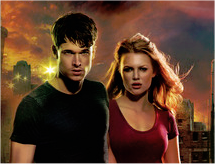 But when she goes after Aern, the truth of the matter uncoils, and Brianna isn't the only one who’s in danger. Suddenly, they’re at the center of a secret war, and unless they can work together, they’ll both have a sacrifice too big to make. 1. Tell me a little about yourself? Describe yourself in 3 words. 2. Have you always wanted to be a author? What were a few other dream jobs you would love to have? I didn’t. I started writing Frey on a whim, just to entertain some friends, and I couldn’t stop. I can’t imagine not doing it now, but it wasn’t even on the radar when I was younger. I’d always enjoyed creating though, and had a vague plan to someday get into advertising or design. 3. What have you found to be most challenging in becoming an author? It’s tough to put yourself out there sometimes. You work so hard on crafting the best story you can, and then you present it to the world, and you really want them to love it as much as you do. But that’s part of the fun, too, because sometimes they do. 4. Where did you come up with the idea for your book, Bound by Prophecy? 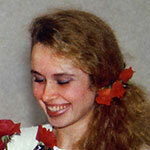 The idea for Bound by Prophecy came to me while writing book three in the Frey Saga. I was toying with the idea of mind control, that power Frey had over the humans, and I thought how much fun a talent like that would be in our current world. I jotted down Aern’s first line and the story took off from there. 5. What is one of the first books you loved as a child? One of my first memories is of Little Miss Suzy by Miriam Young. My grandmother had read it so many times she had it memorized. When it went missing, she would pull an “invisible” copy from behind her pillow and read us the story word for word. She would stop at each page and describe the beautiful artwork, and we’d stare into the empty air between her hands. That’s always made it special to me, and every time a new baby comes into the family, their first gift is a copy of the (real) book. 6. What makes Bound by Prophecy special? Tell me using only 50 words. It’s a new adult paranormal fantasy with a male lead. The story is fast paced as main character Aern tries to protect two girls at the center of a prophecy, one of which he’s supposed to be bound to. Of course, he ends up falling for the wrong one. 7. Do you enjoy reading? What type of books do you like? Favorite authors? Absolutely. I read nearly ever genre except horror – I’m a huge chicken in that respect – but my favorites are young adult and paranormal fantasy. And I love to laugh, so right now the top of my list includes anything by Molly Harper or Kevin Hearne. I also love some of the classics, namely Jane Austen. 8. What advice would you give to someone who wants to be an author but is afraid to even begin writing? Just do it. If it’s something you want, the only way to get there is to try. Don’t be afraid, you don’t have to share it until you’re happy with what you've got and you might just find you’re brilliant. Either way, the more you write, the better you’ll get, so start now. It can be hard, but you’ll love it. 9. What do you like to do in your free time? Hobbies? I have very little free time anymore, but when I do, I spend it outdoors all summer – at the lake when possible. In the winter, it’s wrapped up in a blanket with a good book and sometimes I get the chance to paint and draw. 10. Thanks for being here on my blog, Melissa. Do you have any closing thoughts or final remarks you’d like to share with my readers? Thanks for having me, Beckie! And I’d like to thank the readers as well, because they’re truly what makes this all possible and I appreciate every single one of them. Your very welcome, Melissa! Thank YOU for stopping by! Enter using the rafflecopter form below to win a finished PAPERBACK copy, along with 2 ecopies for international readers. I love the book cover. I also love the blurb. The book has a very interesting storyline that I want to read it.